Chennai: The Directorate of Medical Services has given a grace period to over 50,000 healthcare centres across the state in order to apply for the registration with the State Health Department under the Tamil Nadu Clinical Establishments Act, 2018 before May 31, 2019. If these medical facilities somehow fail to apply for the registration, they may face complete shutdown. Earlier to operate healthcare centres in Tamil Nadu, the State Government had directed all hospitals and diagnostic units to gain licenses under the Clinical Establishment Act by applying for it on/before 31st March 2019. However, the health department received only just 18,000 applications from various establishments against the expected 75,000. In view of this, the health department decided to give a grace period to the medical facilities. “The deadline for registration ended on March 31. As per the Act, from June 31, we can initiate action or close down those establishments which have not applied for registration. They still have some grace period left to register themselves,” Director of medical services Dr N Rukmini informed TOI. 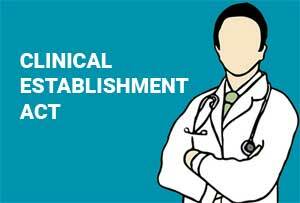 The state government had issued notifications related to Tamil Nadu Clinical Establishments (Regulations) Rules, 2018. The rules came in being with its publication in the Tamil Nadu Extraordinary Gazette dated June 4, 2018, and defined the minimum infrastructure and manpower requirements to be maintained by all clinical establishments in the state. The rules are valid on both Allopathy and AYUSH. The rules notified that all public or private healthcare centres starting from consulting rooms, clinics or polyclinics to dispensaries, diagnostic centers, x-ray centers, dentist centers, maternity centres, nursing homes, and hospitals should get themselves registered for licenses under Clinical Establishment Act. The deadline for the application ended on March 31. Any institution that failed to apply won’t be able to operate. Around 8,000 healthcare units applied in the Health Department of the state for the licenses which would be applied for the next 5 years. The Directorate of medical services developed software to register all hospitals under a centralized process. The Joint directors of medical services in the districts have also collected hand-filled applications along with a demand draft towards registration. The joint directors will inspect these units to ensure that they fulfill the infrastructure and human resource requirements as specified in the Act. If the hospitals qualify, they will be given a license for the coming five years. The Indian Medical Association have welcomed the move while the associations of Unani practitioners and diagnostic laboratories associations have moved court seeking exemptions or relaxations in the norms. This rule indirectly close all small NH in state and helps corporate setup. Rural GP\’s couldn\’t meet out the expenses of establishing norms because 15 – 20% pts are treated free of cost in rural areas.Remaining pay little to the doctors. Government to consult the doctors before enforcing this rule. Of course we agree that available facilities to be improved for patients. Not all the doctors are rich to spend so much money to fulfill the norms. We welcome govt.could sanction interest free loans to the doctors running clinics with limited facilities. Also, as mentioned in write up of the article itself June 31st doesn\’t exist. That solves all the problems.